Copyright em nome de Pedro Miguel Pinto Gonçalves Gouveia Pedrosa e da FCT, UNL. trusting in me. I am sincerely thankful. being pillars of this work; and for the unconditional friendship. honored to have worked with them. Viveiros, Prof. Isabel Couto and Diana Machado. My closest friends, for always being there when I needed them. grandparents. I might not always be close to you but you know you are always in my heart. Márcia for the true love. Palavras-chave: nanodiagnóstico; nanopartículas de ouro; tuberculose; multiplex PCR. most frequent genotypes circulating in the Lisbon Health Region. Keywords: nanodiagnostics; gold nanoparticles; tuberculosis; multiplex PCR. Pedrosa P., Veigas B., Machado D., Perdigão J., Portugal I., Couto I., Viveiros M., Baptista P.V. 2013, Feb. Gold nanoprobes methodology for diagnosis of Multi-Drug Resistant Tuberculosis. desenvolvida em Portugal. Workshop Multidrug-Resistant Tuberculosis, IHMT, Lisbon, Portugal. of multidrug resistant tuberculosis (MDR-TB) – resistance to two first line antibiotics – are increasing. the Mycobacterium tuberculosis complex (MTBC) that includes other human infecting subspecies. cellular wall is rich in mycolic acids impermeable to common dyes and stains used in bacterial studies. them hard to grow in culture (McMurray, 1996). evolve to an active form of the disease (McMurray, 1996; WHO, 2012). however this is not a reality in TB high-burden countries (ATS et al., 2003). mechanisms of resistance will be clarified. failure and fatal clinical outcome (Mitchison and Nunn, 1986). Resistance to INH is far more complex and its full mechanism of action is still not understood. Diagnosis of TB can be difficult since it shares the same early symptoms with other diseases. profiles, but due to the low growing rate of Mycobacterium tuberculosis results can take 2 to 6 weeks. expensive, which is the main bottleneck to overcome. and noble metal nanoparticles are examples of such nanomaterials (Eustis and El-Sayed, 2006). different purposes. I will focus on the properties of 14 nm diameter, spherical, citrate capped AuNPs. that does not precipitate nor aggregate (Ji et al., 2007). accelerating functionalisation (Zhang et al., 2012). special optical properties (Sato et al., 2005). 2006; Sato et al., 2005). sample is added to the Au-nanoprobes followed by a salt that promotes the nanoprobes’ aggregation. nanoparticles allows a simple visual analysis which can also be quantified in a spectrophotometer. be WT or Mut, the redundancy of the two probes gives robustness to the result (Veigas et al., 2010). For its simplicity, speed and low-cost, this method has the capacity to fulfil clinical needs at point-ofcare (Baptista et al., 2008). point-of-care diagnostic makes it an important research topic with direct implication in peoples’ lives. profile of resistances and reduces time and costs. a final concentration of 0.1M Dithiothreitol (DTT) and stored at -20ºC. final concentration of 100 pM and stored at -20ºC. Sterilised by filtration (0.22 μm) and stored at 4ºC. Warm up to 25ºC before used. Sterilised by autoclaving and stored at 4ºC. 1% (w/v) SDS freshly prepared (room temperature). Stored at 4ºC and kept in ice during use. The pH was adjusted to 7 with NaOH, sterilised by autoclaving and stored at 4ºC. The pH was adjusted to 3 with pure HCl, sterilised by autoclaving and stored at 4ºC. autoclaving and stored at 4ºC until further use. incubated at 37ºC 16h with agitation. Cells were pelleted by centrifuging at 1844g for 5 min in 1.5 mL tubes. After 5 minutes on ice, 200 μL of AL II solution was added and mixed by inversion. After 5 minutes on ice, 150 μL of AL III solution was added and mixed by vortex. After 15 minutes on ice, the lysate was centrifuged at 21,460 g for 5 minutes. The precipitate was centrifuged at 21460 g for 15 minutes and the supernatant was discarded. 10. The pellet was washed with 500 μL of ice-cold 70% ethanol. 12. RNase A was added to a final concentration of 25 μg/ml and incubated for 1 hour at 37ºC. synthesis were covered with Teflon and Milli-Q H2O was used in all solutions. was left to cool to room temperature. Microscopy (TEM) and Dynamic Light Scattering (DLS). One volume of thiol-modified oligonucleotide was extracted with two volumes of ethyl acetate. The organic phase was discarded after centrifuging for 5 minutes at 21460 g.
Two more extractions were performed repeating steps 1 and 2.
manufacturer’s instructions, using 10 mM phosphate buffer pH 8 as eluent. NanoDrop, using the optical density at 260 nm provided. oligonucleotide was mixed with a ~15 nM AuNPs solution in a theoretical ratio of 1:200 (AuNP:oligos). pH 8, 0.3 M NaCl, 0.01% (w/v) SDS and let rest at room temperature for an o/n period. seconds and let to rest at room temperature for 20 minutes before the next increment. phosphate buffer pH 8 and once with 10 mM phosphate buffer pH 8 0.1M NaCl. stored in the dark at 4ºC. were registered 30 minutes after salt addition in a microplate reader. DNA for an equivalent volume of 10 mM phosphate buffer pH 8.
volume of 30 μL (Au-nanoprobe final concentration of 2.5 nM). measurements were registered 30 minutes after salt addition in a microplate reader. and shape were determined by analysing the TEM pictures using the imaging software Carnoy 2.0.
sample. DLS analyses were performed at Departamento de Quimica (FCT\UNL). the 3’ nucleotide as it is the best discriminating position (Doria et al., 2007; Veigas et al., 2010). 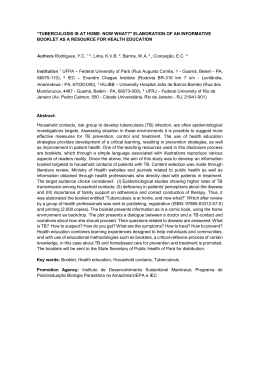 INH resistance in Portugal is characterised by mutation in inhA, namely in its promoter region. was 63º and 66º. The inhA probe was also designed to harbour the mismatch at the 3’ nucleotide. Mut sequences of inhA and rpoB genes. Mut PCR products were sequenced and mutation sites were confirmed (Figure 3.1 and Appendix A1). ND-1000 (Nanodrop Technologies, USA) and the targets were used for Au-nanoprobes detection. previously described in similar non-cross link approaches (Costa et al., 2010; Veigas et al., 2010). spectrum was analysed and theoretical size was calculated using equation 3.1 (Haiss et al., 2007). calculated mean diameter was 13.5 nm. and Abs is the absorbance value at the described wavelength (Haiss et al., 2007). model referring to dsDNA while the probes are ssDNA; or by the solvation around AuNPs. The last evidence of functionalisation was the increase in AuNPs colloidal stability in solution. aggregated nanoparticles in solution (Figure 3.4). nm ratio was calculated and for values lower than 1 the nanoprobes were considerate full aggregated. For both WT and Mut probes 30 mM of MgCl2 was set as the concentration for full aggregation. discriminate mutations using PCR products. discriminating capacity for both probes, was used in the following assays. Figure 3.6 Optimisation of PCR product concentration for Au-nanoprobes discrimination assay. The salt aging method is long known and established, for functionalisation of AuNPs. functionalisation ratios, proving a growing density of oligos per nanoparticle (Figure 3.7). to Au-nanoprobes since they are less functionalised, that stabilises the nanoparticles. assays were performed with salt-ageing synthesised probes. with the four possible combinations between WT and Mut templates of inhA and rpoB plasmids. same amount of product was achieved. amplification yields, a 60 µg/mL of multiplex PCR products was used in the detection assays. destabilisation of Au-nanoprobes (compare Figure 3.5 with Figure 3.10). aggregation. For all combinations the correct genotype was assessed. amplifications, as long as the minimum discriminative concentration is present in the assays. was divided by the ratio of the Mut probe (Equation 3.2). returns positive (red), the two loci are evaluated to search for possible resistances (Figure 3.13). relevant loci are amplified and MTBC probe is tested, then two sets of probes assess for mutations. a M. kansasii (non-MTBC) – were successfully amplified and tested with the MTBC probe. The M.
confirmed by sequencing analysis (Figure 3.14 B). unstable due to salts in PCR that were not taken into account (Figure 3.15). 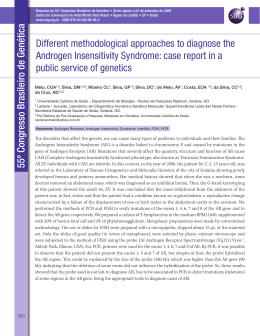 Then inhA and rpoB probesets were used to assess the two relevant mutations (Appendix A3). Mut genotype (in white); B) the same approach used for inhA -15 probe set. Region where there is a higher incidence of this mutation, as the studied population demonstrates. interest followed by Au-nanoprobes characterisation of the molecular alterations involved in MDR-TB. analysis at a peripheral laboratory or in the field (Silva et al., 2011). However, this method does not solve all the problems, remaining some issues to overcome. potential to greatly lower the price of the final product, making it available at point-of-care. nanoparticles. Journal of colloid and interface science 396:53-62.
new strains, new challenges. Expert Review of Anti-infective Therapy 6:713-724.
clinical samples. Clinical chemistry 52:1433-1434. 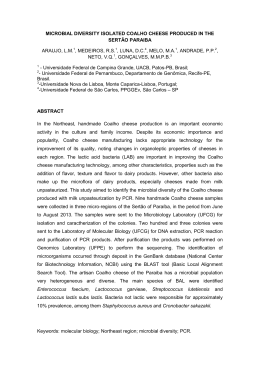 Baptista, P. V., Pereira, E., Eaton, P., Doria, G., Miranda, A., Gomes, I., Quaresma, P. & Franco, R.
Microbiology and Infectious Diseases 16:1464-1469.
nucleotide polymorphism/mutation detection. IET Nanobiotechnology 1:53-57.
gold nanoparticles for biomedicine. Chemical Society reviews 41:2740-2779. Interactions. Langmuir : the ACS journal of surfaces and colloids 26:14409-14413.
properties of nanocrystals of different shapes. Chemical Society reviews 35:209-217.
gold nanoparticles from UV-vis spectra. Analytical chemistry 79:4215-4221.
properties and recent applications in cancer diagnostics and therapy. 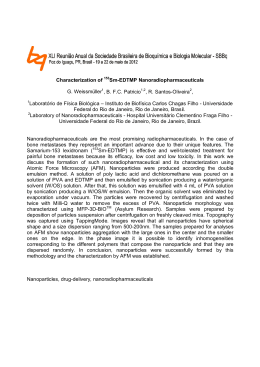 Nanomedicine 2:681693. Reduction: The Third Role of Citrate. Journal of the American Chemical Society 129:1393913948.
dynamic light scattering method for in vitro toxicology assessment. Toxicology in Vitro 23:927934. Economic Benefits. Health Affairs 28:w730-w742. sols. The Journal of Physical Chemistry 86:3391-3395. 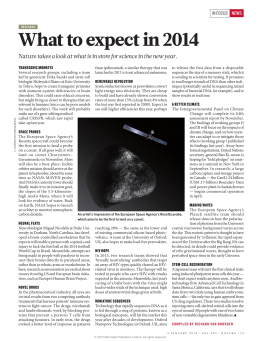 Sciences of the United States of America 101:14036-14039. 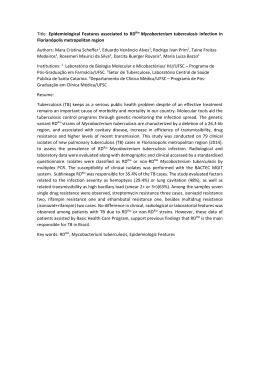 Machado, D., Perdigao, J., Ramos, J., Couto, I., Portugal, I., Ritter, C., Boettger, E. C. & Viveiros, M.
Skin Test or Whole-Blood Interferon-γ Release Assays. Clinical Infectious Diseases 45:826836. Miller, L. P., Crawford, J. T. & Shinnick, T. M. 1994. The rpoB gene of Mycobacterium tuberculosis. Antimicrobial Agents and Chemotherapy 38:805-811. Musser, J. M. 1995. Antimicrobial agent resistance in mycobacteria: molecular genetic insights. Countries: Challenges and Opportunities. Clinical Microbiology Reviews 24:314-350. Sato, K., Hosokawa, K. & Maeda, M. 2003. Rapid aggregation of gold nanoparticles induced by noncross-linking DNA hybridization. 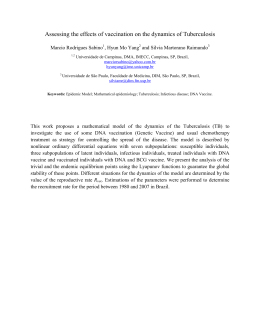 Journal of the American Chemical Society 125:8102-8103.
detection method for single-base substitutions. Nucleic acids research 33:e4. 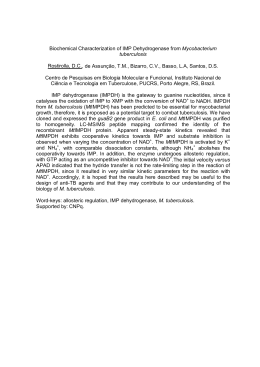 Silva, L. B., Veigas, B., Doria, G., Costa, P., Inacio, J., Martins, R., Fortunato, E. & Baptista, P. V.
Mycobacterium tuberculosis complex. Biosensors & bioelectronics 26:2012-2017. Telenti, A., Imboden, P., Marchesi, F., Matter, L., Schopfer, K., Bodmer, T., Lowrie, D., Colston, M. J. & Cole, S. 1993. Detection of rifampicin-resistance mutations in Mycobacterium tuberculosis. genetics. Annual review of microbiology 61:35-50. Viveiros, M., Martins, M., Couto, I., Rodrigues, L., Machado, D., Portugal, I. & Amaral, L. 2010.
infections. Expert Review of Anti-infective Therapy 8:465-480. Multidrug-Resistant Tuberculosis. 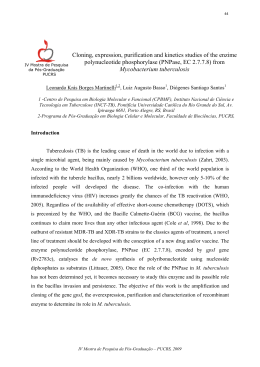 Journal of Clinical Microbiology 43:4880-4884.
tuberculosis. Antimicrobial Agents and Chemotherapy 46:2804-2810. Wallis, R. S., Pai, M., Menzies, D., Doherty, T. M., Walzl, G., Perkins, M. D. & Zumla, A. 2010. Biomarkers and diagnostics for tuberculosis: progress, needs, and translation into practice. WHO 2009. 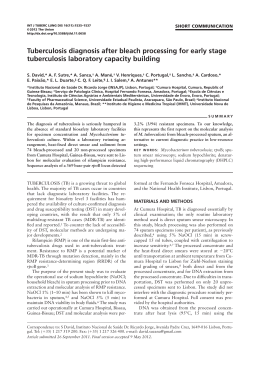 New laboratory diagnostic tools for tuberculosis control. Accessed at July 2013.
the American Chemical Society 134:7266-7269.
isoniazid resistance of Mycobacterium tuberculosis. Nature 358:591-593. Nanoparticles in Aqueous Solutions by Mononucleotides. Langmuir 23:7143-7147. Table A3 Ratio of WT probes (Abs525 \ Abs570) divided by ratio of Mut probes (Abs525 \ Abs570). genotypes (+) and wildtype (-).